The Good News: What's New? Hey everyone! Just going to give you a quick update on what we have been up to for the last 2 weeks. Greg and I are grandparents...well sort of...our Miniature Schnauzer, Gracie, had her first litter of puppies a few weeks ago. She had 7 but only 3 survived. Mom and puppies are doing very well. We did not even know that she was pregnant until about 3 weeks before she had them. Up until 3 days before she gave birth Greg remained in denial. We were sitting on the back porch playing Chicken Foot, a Dominoes game, when Brittany was rubbing Gracie's belly and felt movement. Once Greg felt them move he was a little stunned. =) We figured out when it happened...it was while we were visiting in the States. We had left Gracie with another missionary family, actually we had house sat for them for a year and taken care of their female dog Poppet. What we didn't know is that their daughter came from Florida and brought a male Yorkie. Needless to say he found Gracie irresistible and now we have 3 puppies that we call Yauzers (mix of Yorkie and Schnauzer). They are so cute! The kids are trying to talk us into keeping them all but that is highly unlikely. =) We will keep one...they have already picked him out. 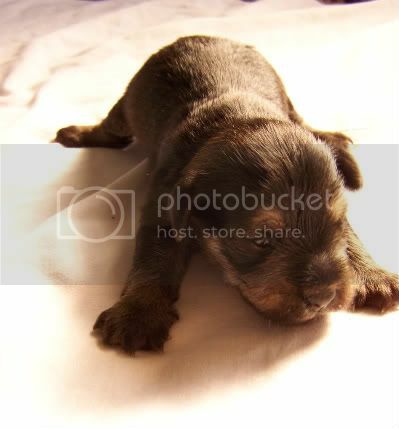 His name will be Zachi (short for Zachheus), he is the wee little one. =) They are starting to walk...well, its more like wobbling, really. All is well and busy here in the D.R. We are making the last few preparations for the Team we have coming March 29th - April 5th from Bradenton Christian School in Bradenton, Florida. We will be going around to different parts of the country evangelizing, painting and church, working at a girls' home in La Romana, painting at Restoration Ranch, etc. ~Matthew recently learned that he will be getting his braces off as early as June of this year which is almost a year early! He is pretty excited about that. So are we because his braces cost about one-third the cost in America. He is growing taller and taller and has just passed me by half an inch. I will soon be the shortest in the family...again. =) He is ramping up his basketball skills since he plays everyday with the guys from the neighborhood while also having a chance to be a witness to them. ~Isaiah has a birthday coming up at the end of March (31st). He will be 12 years old. It is just not fair that they are growing up so fast! He is loving Science more and more and is really into Geology. He recently developed his own blog site where he posts devotions and other things that God is laying on his heart. ~We are really enjoying the new way we are doing devotions each morning. I, Melynda, read a little from a devotional book then each person in our family shares about the scriptures that they read the day before on their own and what they felt God was telling them through His Word and how they can apply it to their own lives. Then Greg finishes it out by reading a little from a book, currently we are reading Blue Like Jazz by Donald Miller, and we discuss what he read. We try to pick a book that makes you "think outside the box" and to see from different perspectives so that when we come across those who think differently we are able to respond with God's love, understanding, and His Word. God is moving in each of our lives on a new level and it is AWESOME! It is more "awe"some to see what God is doing in the lives and thought processes of our children. Watching them get excited about God's Word and about them developing a deeper relationship with Him in their personal time. Please pray for the upcoming Team...for safe travel, that we be lead by the Holy Spirit in everywhere that we go and all that we do, pray that lives would be touched and changed for God's glory! yay i can't wait for the team! I just watched the video and I am so excited! No wait..I am sad, no not that either, I am mad....wait a minute, I am excited again. I am sad that I am not there, and mad that I am not there, but I am so very excited that yall are there!! And for the car, ya'll deserve the best and all the $$ is already there. Got Goat? I can't wait! !